*Sold in packages in the fresh produce section of supermarkets. Nutritional Information Per Serving (1/6 of recipe): 295 calories; 8 g fat (2 g saturated fat; 4 g monounsaturated fat); 100 mg cholesterol; 686 mg sodium; 20 g carbohydrate; 3.6 g fiber; 35 g protein; 4.3 mg niacin; 0.5 mg vitamin B6; 3.2 mcg vitamin B12; 5.3 mg iron; 33.3 mcg selenium; 8.7 mg zinc. 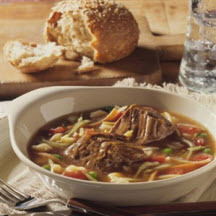 Recipe and photograph provided courtesy of The Beef Checkoff.